Wow, what a week! Ghost Fall is out and we've already got some satisfied customers. Please keep on picking up your ebook copy to support us and to keep on reading the story of Herne and Iris. Book 3 is underway (and will be more underway now that Kara and Ginger are out from under assembling book 2! ), so as time goes on we'll occasionally drop some little hints about that. So, what else has been going on in the world of our creators? 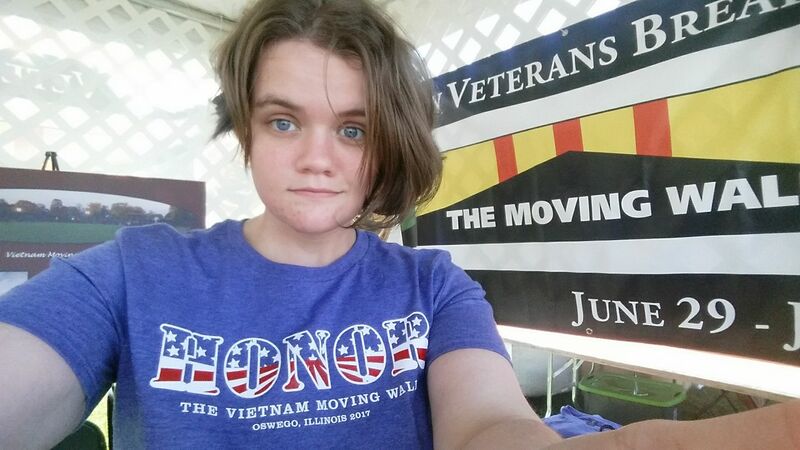 Ginger's place of employment, Imagination Print and Design, is collaborating with the Vietnam Moving Wall's stop in Oswego to sell some absolutely gorgeous shirts. Check out their selections and pick some up! Online ordering for these shirts ends on Monday, July 31, so you only have a month to get yours! Imagination Print and Design is also doing a series of pop-up shops this summer. Check out their Facebook page to see new designs for $10! Meanwhile, Kara has just finished working with Crunchyroll and Fathom Events on an ongoing promotion for the new film Resident Evil: Vendetta! Check out her interview with voice actors Matt Mercer (Leon S. Kennedy) and Erin Cahill (Rebecca Chambers) covering the film, the pair's other video game and acting work, the Overwatchiversary, and the awesomeness of the anime and game fandom. You can also rent or buy the film on Amazon Video right now. DVD and Blu-Ray copies go on sale July 18! That's all for now -- see you next week! And please send us your thoughts on Book 2, and be sure to refer your friends! BOOK 2: "Ghost Fall" Now in Print! BOOK 2: From Screen to Print! BIG NEWS: "Ghost Fall" Goes on Sale THIS TUESDAY!